Shanthi, S., Asghar, B., Mansoor, S. (2018). The Kinetics of Tripropylammonium Fluorochromate Oxidation of Mandelic Acids. Iranian Journal of Chemistry and Chemical Engineering (IJCCE), 37(3), 97-105. Shanmugam Shanthi; Basim Hussain Asghar; Syed Sheik Mansoor. "The Kinetics of Tripropylammonium Fluorochromate Oxidation of Mandelic Acids". 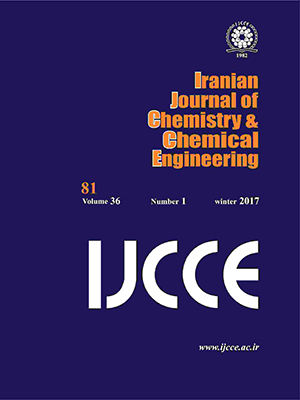 Iranian Journal of Chemistry and Chemical Engineering (IJCCE), 37, 3, 2018, 97-105. Shanthi, S., Asghar, B., Mansoor, S. (2018). 'The Kinetics of Tripropylammonium Fluorochromate Oxidation of Mandelic Acids', Iranian Journal of Chemistry and Chemical Engineering (IJCCE), 37(3), pp. 97-105. Shanthi, S., Asghar, B., Mansoor, S. The Kinetics of Tripropylammonium Fluorochromate Oxidation of Mandelic Acids. Iranian Journal of Chemistry and Chemical Engineering (IJCCE), 2018; 37(3): 97-105. The oxidation of Mandelic Acids (MA) to the corresponding oxoacids with tripropylammonium fluorochromate (TriPAFC) in aqueous acetic acid has been studied. The reaction is first order with respect to [TriPAFC], [MA] and [H+]. The oxidation of α-deuteriomandelic acid shows the presence of a primary kinetic isotope effect (kH/kD = 5.54 at 303 K). The reaction has been found to be catalyzed by H+ ions. The various thermodynamic parameters for the oxidation have been reported and discussed along with the validity of the isokinetic relationship. The Exner plot showed that all the selected mandelic acids are oxidized by the same mechanism. Bhuvaneshwari D.S., Elango K.P., Correlation Analysis of Reactivity in the Oxidation of Anilines by Nicotinium Dichromate in Nonaqueous Media, Int. J. Chem. Kinet., 38: 657–665 (2006). Bhuvaneshwari D.S., Elango K.P., Effect of Preferential Solvation on the Kinetics and Thermodynamics of Oxidation of Anilines by Nicotinium Dichromate, Z. Naturforsch., 60b: 1105– 1111 (2005). Garg D., Kothari S., Kinetics and Mechanism of the Oxidation of Some α-hydroxy Acids by Hexamethylene Tetramine-Bromine, J. Chem. Sci., 26: 333-338 (2004). Anjana, Sharma P.K., Banerji K.K., Kinetics and Mechanism of the Oxidation of α-hydroxy Acids by Benzyltrimethylammonium Chlorobromate, J. Chem. Sci., 111: 741-746 (1999). Tewari K.C., Singh H.N., Singh V.S., Kinetics of Oxidation of α-Hydroxy Acids by Ceric Sulfate, Bull. Chem. Soc. Japan., 49: 2852-2854 (1976). Dave I., Sharma V., Banerji K.K., Kinetics and Mechanism of Oxidation of Some α-hydoxy Acids byQuinolinium Fluorochromate, Indian J. Chem., 39A: 728-733 (2000). Kumbhat V., Sharma P.K., Banerji K.K., Kinetics and Mechanism of the Oxidation of Some α-hydroxy Acids by 2,2′-Bipyridinium Chlorochromate, Int. J. Chem. Kinet., 34: 248-254 (2000). Baghmar M., Sharma P.K., Kinetics and Mechanism of Oxidation of Some α-hydoxy Acids byTetrabutylammonium Tribromide, Indian J. Chem., 40A: 311-315 (2001). Kothari A., Kothari S., Banerji K.K., Kinetics and Mechanism of Oxidation of some α-hydoxy Acids by Butyltriphenylphosphonium Dichromate, Indian J. Chem., 39A: 734-739 (2000). Pohani P., Anjana, Sharma P.K., Kinetics and Mechanism of Oxidation of Some α-hydoxy Acids by Benzyltriethylammonium Chlorochromate, Indian J. Chem., 45A: 2218-2223 (2006). Banerji J., Sharma P.K., Banerji K.K., Kinetics and Mechanism of the Oxidation of Some α-hydroxy Carboxylic Acids by (bis(trifluoroacetoxy)iodo) benzene, Indian J. Chem., 46A: 445-448 (2007). Swami P., Yajurvedi D., Mishra P., Sharma P.K., Oxidation of Some α-hydroxy Acids by Tetraethylammonium Chlorochromate: a Kinetic and Mechanistic Study, Int. J. Chem. Kinet., 42: 50–55 (2010). Vyas N., Daiya A., Choudhary A., Sharma M., Sharma V., Kinetics and Mechanism of Oxidation of Some α-hydoxy Acids byQuinolinium Chlorochromate, Eur. Chem. Bull., 2: 859-865 (2013). Mahjob A.R., Ghammami S., Kassaee M.K., Tetramethylammonium Fluorochromate (VI): a New and Efficient Oxidant for Organic Substrates, Tetrahedron Lett., 44: 4555-45557 (2003). Ghammamy S., Mazareey M., Tributylammonium Chlorochromate, (C4H9)3NH[CrO3Cl] (TriBACC): A New, Mild and Stable Oxidant for Organic Substrates, J. Serb. Chem. Soc., 70: 687-693 (2005). Acharya S.P., Rane R.A., Trimethylammonium Chlorochromate (TMACC). a New, Mild, Stable, Efficient and Inexpensive Chromium(VI) Oxidation Reagent, Synthesis., 127-128 (1990). Patwari S.B., Khansole S.V., Vibhute Y.B., Kinetics and Mechanism of Oxidation of Aniline and Substituted Anilines by Isoquinolinium Bromochromate in Aqueous Acetic Acid, J. Iran. Chem. Soc., 6: 399-404 (2009). Oezguen B., Yaylaoglu A., Sendil K., 4-Benzylpyridinium Fluorochromate: An Efficient and Selective Oxidant for Organic Substrates, Monatshefte für Chemie, 138: 161-163 (2007). Kassaee M.Z., Sayyed-Alangi S.Z., Sajjadi-Ghotbabadi H., Synthesis and Reactions of N-Methylbenzylammonium Fluorochromate(VI) on Silica Gel, a Selective and Efficient Heterogeneous Oxidant, Molecules., 9: 825-829 (2004). Koohestani B., Javanshir Z., Ghammamy S., Mehrani K., Afrand H., Saghatforoush L., Synthesis and Characterization of a New Oxidation Reagent: Tetrahexylammonium Chlorochromate, (C6H13)4N[CrO3Cl], J. Mex. Chem. Soc., 52: 116-119 (2008). Malani N., Baghmar M., Sharma P.K., Kinetics and Mechanism of the Oxidation of Some Organic Sulfides by Morpholinium Chlorochromate, Int. J. Chem. Kinet., 41: 65–72 (2009). Ghammamy S., Hashemzadeh A., Tripropylammonium Fluorochromate (TriPAFC): A Convenient New Reagent for Oxidation of Organic Substrates, Bull. Korean Chem. Soc., 25: 1277-1279 (2004). Mansoor S.S., Shafi S.S., Oxidation of Aniline and Some para-substituted Anilines by Benzimidazolium Fluorochromate in Aqueous Acetic Acid Medium - A Kinetic and Mechanistic study, Arab. J. Chem., 7: 171–176 (2014). Mansoor S.S., Shafi S.S., Oxidation of Aliphatic Alcohols by Triethylammonium Chlorochromate in Non-Aqueous Medium - A Kinetic and Mechanistic Study, Arab. J. Chem., 7: 312–318 (2014). Asghar B.H., Mansoor S.S., Hussain A.M., Malik V.S., Aswin, K., Sudhan, S.P.N., Oxidation of Aliphatic Aldehydes by Benzimidazolium Fluorochromate in Non-Aqueous medium – A Kinetic and Mechanistic Study, Arab. J. Chem., 10: S2115–S2123 (2017). Mansoor S.S., Malik V.S., Aswin K., Logaiya L., Hussain A.M., Kinetics and Thermodynamics of Oxidation of Some Thio Acids by Tripropylammonium Fluorochromate in N, N-Dimethyl Formamide and Acetic Acid Mixture, J. Saudi Chem. Soc., 20: S77-S84 (2016). Malik V.S., Asghar B.H., Mansoor S.S., Kinetics and the Mechanism of Oxidation of Methoxy Benzaldehydesby Benzimidazolium Fluorochromate in an Aqueous Acetic Acid Medium, J. Taibah Univ. Sci., 10: 131–138 (2016). Mansoor S.S., Shafi S.S., Studies on the Kinetics of Tripropylammonium Fluorochromate Oxidation of Some Aromatic Alcohols in Non-Aqueous Media, J. Mol. Liq., 155: 85-90 (2010). Mansoor S.S., Shafi S.S., Oxidation of Benzhydrol by Tributylammonium Chlorochromate: a Kinetic and Mechanistic Study, Reac. Kinet. Mech. Cat., 100: 21–31(2010). Amis E.S., “Solvent Effects on Reaction Rates and Mechanisms”, Academic Press, New York 42 (1967). Lente G., Fabian I., Poe A.J., A Common Misconception About the Eyring Equation, New J. Chem., 29: 759 – 760 (2005). Exner O., Streitwiser J.R., Talt R.W., “Progress in Physical Organic Chemistry”, John Wiley, New York 41 (1973). Leffler J.F., Grunwald E., “Rates and Equilibrium of Organic Reactions”, Wiley, New York (1963). Hammett L.P., “Physical Organic Chemistry”, 1st ed., McGraw-Hill, New York (1940). Mehnert R., Brede O., Janovsky I., Pulse Radiolysis of Aqueous Solutions of Thiosulphate, Radiat. Phys. Chem., 23: 463-468 (1984). Wiberg K.B., “Physical Organic Chemistry”, John Wiley, New York (1963). Littler J.S., Oxidations of Olefins, Alcohols, Glycols and other Organic Compounds, by Inorganic Oxidants Such as Chromium(VI), Manganese(VII), Iodine(VII), Lead(IV), Vanadium(V) and Halogens, Considered in the Light of the Selection Rules for Electrocyclic Reactions, Tetrahedron., 27: 81 – 91 (1971). Brown H.C., Okamoto Y., Electrophilic Substituent Constants, J. Am. Chem. Soc., 80: 4979-4987 (1958).